Environmental sustainability is integral to the existence and growth of any manufacturing industry. Aluminium as an industry being highly energy intensive has always attracted a lot of attention from the global R&D fraternity who, time and again, has come up with solutions aimed at reducing the consumption of non-renewable energy and emission of greenhouse gases. In the process, remarkable advancement has been made in aluminium scrap recycling and recovery which eventually has resulted in the growth of a full-fledged aluminium scrap industry. Globally, aluminium products such as used beverage and aerosol cans, aluminium foils, architectural components and automotive parts are recycled in huge volumes to extract secondary aluminium. Aluminium industry scrap too is re-melted to yield reasonably high-purity molten metal. Secondary aluminium is essential to the industry’s survival because even new metal often requires the use of an optimised combination of recycled materials. In most countries, there exists a well-established market for recycled aluminium with firmly defined distribution chains. 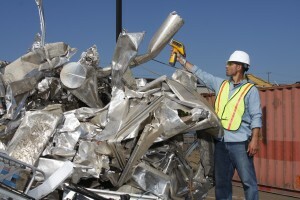 According to the recycling data published by the U.S. Geological Survey, in 2015, aluminium recovered from purchased scrap in the U.S. was about 3.61 million tons, of which about 54% came from new (manufacturing) scrap and 46% from old scrap (discarded aluminium products). 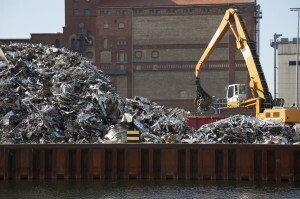 Aluminium recovered from old scrap was equivalent to about 30% of apparent consumption. USGS preliminary data indicate that recovery of aluminium from scrap totaled an estimated 8,244 million pounds in 2015, up 2.8% over the 2014 total of 8,018 million. Aluminium beverage cans are the most recycled beverage packaging type in the U.S. with an industry recycling rate of 66.7% in 2013. According to the data released by the Aluminium Association, Can Manufacturers Institute (CMI) and Institute of Scrap Recycling Industries(ISRI), same year, the industry recycled 1.72 billion pounds of used aluminium beverage cans – the equivalent of 60.2 billion cans! The recycling rate for aluminium beverage cans in the European Union, Switzerland, Norway and Iceland is also reasonably high. It increased by 1.8% in 2007 to a new record level of 71.3% in 2013. European Aluminium considers this result an important milestone on its path towards its voluntary recycling target for used beverage cans of 80% by 2020. Aluminium beverage cans have been an integral part of the European Union’s Circular Economy. Over the past three years, the number of councils in the UK collecting aerosol cans has increased from 87% to 96%, providing almost complete coverage throughout the UK. Meanwhile, foil recycling has also seen a dramatic increase in collection, from just 35% of councils in 2007 to 86% today. When it comes to aluminium scrap recycling, this Latin American country tops the world chart. According to the Brazilian Aluminium Association (ABAL) and the Brazilian Association of Highly Recyclable Cans Manufacturers (ABRALATAS), till February 2016, Brazil has recycled 289,500 tonnes of aluminium cans out of 294,200 tonnes on the market, representing 12.5 percent over the previous year. In 2014, the country’s aluminium beverage cans recycling rate peaked at 98.4%! This demonstrates nothing but the maturity level and structural soundness of the Brazilian recycling industry. India is yet to emerge in a big way as an aluminium recycling country. Given the fact that India’s per capita consumption of aluminium is still one of the lowest at 2.2 kg against a world average of ~8kg, with 22-25 kg in developed nations, it will be too early to call it a day, but the area of concern here is the complete lack of structure for aluminium scrap handling and secondary metal recovery. India’s metal recycling rate is just about 25%. All the activities related to aluminium scrap recovery are limited to the unorganised sector, catering mostly to the utensil and casting industries. There are hardly any laws governing the scrap sector except for the e-waste which came into existence in 2011. Currently, there is only one recycling unit of Hindalco in the organised sector at Taloja with 25,000 tonnes annual capacity. This plant too was facing challenges due to less availability of scrap. Of late, the production from the unit has improved and the plant is now operating at 80% of the rated capacity as against earlier capacity of 60%. The unorganized sector, on the other hand, is characterized by the presence of a large number of SMEs clustered mostly in the southern states of India. What’s stopping India from recycling more aluminium scrap? A Frost & Sullivan Metals and Minerals Practice report published in early 2015 said the Indian Metal Recycling industry was “challenged by key interlocking crises of minimal existence of a metal scrap recycling ecosystem and lack of any domestic laws and legislation that assist and apply to the industry.” True that. No concerted effort has ever been made till now to utilize tons of non-segregated scrap thrown away everyday by industry. The aluminium recycling business needs awareness among various participants within the metals ecosystem and requires monitoring and promotion from the government. Also, there is no viable domestic aluminium scrap market here, and to top it all, there is a protectionist environment in place on the import of metal scrap (including aluminium). India’s primary aluminium producers, hit by rising cheap imports from China and Middle East, are seeking a 15% safeguard duty hike on aluminium imports. But analysts are of the opinion that any further hike (it has already been increased from 5% to 7.5% in the last Budget) would adversely affect aluminium downstream and scrap industry. Why should India take aluminium scrap recycling more seriously? The Frost & Sullivan report on ‘Metals and Minerals Practice’ noted that since the sector was currently unorganized and large volumes of unaccountable/non-segregated scrap are being “inadequately utilized,” there is more burden on primary production, which is depleting India’s natural resources. If India increases the percentage of recycled metal from the existing of 20-30% to the world benchmark of 45%, it will be able to conserve 8 lakh tones of bauxite reserves every year! Secondly, making a transition to aluminium scrap recovery and recycling to generate more metal for reuse will help the country to cut down on its yearly power consumption substantially. Consumption of aluminium foil, beverage cans, and other packaging is rising steadily, thanks to growing urbanization and changing lifestyle of people in India. Hence, to keep the surroundings clutter-free, it is necessary that these domestic wastes are collected and treated properly for sustainable reuse purposes. Finally, an organized scrap industry will help create employment opportunities opening up scope for entrepreneurship, skill development, and enhancement of overall safety standards that is presently lacking in the unregulated sector. Realization is creeping in, what if slowly, that recycling metal scrap is a must in today’s scenario as India badly needs to reduce its carbon footprint while making judicious use of its natural resources. The Modi government soon after coming to power at the Centre had compelled the Metal Recycling Association of India (MRAI), a representative trade body, to ask the federal government to frame and implement a Metal Recycling Policy and accord it “industry status.” For Indian recycling industry this was a much-needed wakeup call to convert large amounts of metal scrap into recycled raw material. Another change is in the offing – the government is finally considering incentives to encourage vehicle owners to scrap old cars, a scheme that will deliver multiple benefits including reducing pollution, boosting growth of the industry and generating jobs, said Nitin Gadkari, Union Minister for Road Transport, Highways and Shipping. The scheme, awaiting Cabinet approval, will create a lot of business opportunities for aluminium scrap dealers, suppliers, and exporters in India. The “Make in India” drive has provided a new impetus to the country’s existing companies as well as start-ups to take up metal/aluminium scrap recycling in a more organized manner. A Nagpur-based NGO Centre Sustainable Development (CSD) has carried out a survey to quantify tetrapack waste generated in the city in a view to recycle them at a later stage. Tetrapack contains 60% cardboard and 40% aluminium foil. Gravita India Ltd started a recycling plant at Phagi, Jaipur with an initial capacity of 6000 MTPA of aluminium alloy production from recycled aluminium scrap. Chandigarh-based start-up Trestor is building a machine that can provide clean drinking water to urban poor in lieu of a used aluminium beverage can or aerosol can or a plastic bottle that needs to be put inside the machine. Mahindra Intertrade has signed MoU with MSTC to set up India’s first auto shredding facility. The proposed facility will be equipped with state-of-the-art, fully automated end-of-life vehicle recycling equipment and will be India’s first such facility. It is observed that the proportion of recycled aluminium would soon reach a figure of about 35-40% of total aluminium consumption. To achieve that target a lot more effort has to be put in by the government as well as industry people. With the need for industry development and employment generation growing stronger and State initiatives like ‘Swachh Bharat Abhiyan’ gaining momentum, it is expected that the aluminium scrap industry too will become organized and more technologically advanced in the years to come. What does a Sustainable Aluminium World Look Like? Yes. Especially in transport sector it is a must.For Penetration and avg per vehicle use of Aluminium in the Indian market , dedicated scrap management of special alloys is essential. Recycling models have to be there for unlocking the recyclability feature and promote Aluminium as a truly green metal. Sustainability by reducing Carbon foot prints is possible by increasing use of recycled Aluminium. As more and more industries start using various grades of aluminium dedicated recycling models have to be in place in next 3-5 years time. As I am thinking of starting a secondary Aluminium Alloy Ingot manufacturing unit, this article of yours has added to my determination. - Cheap import from China. In the given situation do you still think that it is the right time to enter into this segment.